An outdoor structure offers great storage opportunities—and so much more! If you're considering erecting a shed on your property, make sure you site it correctly and choose a structure that truly suits your needs, your landscape, and your lifestyle. Learn more here! 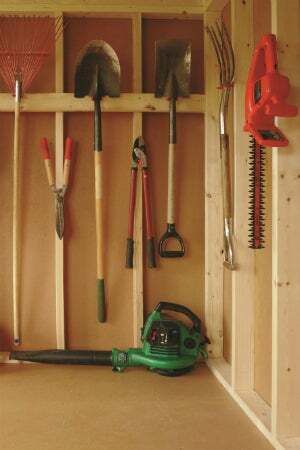 A backyard shed frees up your home and garage by storing cumbersome essentials like your riding mower, hedge trimmers, and other lawn care equipment. But these sturdy little buildings can serve a host of other practical functions—and hobbies too. Think chicken coop, greenhouse, screening room—the list is limitless! For a shed to live up to its potential, however, it’s crucial to avoid common building mistakes. The dos and don’ts listed here, courtesy of the LP® Outdoor Building Solutions® pros, will help ensure that your shed meets your needs for years to come, whether you’re simply using it for storage or tricking it out as your outdoor fun zone. Once you decide that adding a shed will increase the enjoyment of your outdoor space, it’s time to ask pertinent questions to assess your needs. Consider exactly how you want to use your shed, what design will best suit those tasks, and how much your budget will allow. Learn what features are most popular, and why. Also research what’s really involved with building a shed yourself, as opposed to hiring a pro to do the job, and be sure you understand such important factors as warranty and delivery. The last thing you want is to build a shed only to discover that it’s too small to hold your stuff, handle your hobby, or otherwise meet your needs. By the same token, you don’t want a shed that’s so large it overwhelms your property and looks ungainly behind your house. Choosing the wrong size shed is a common homeowner error, but LP Outdoor Building Solutions’ handy tool helps you get it just right. Check it out, and you’ll see that size does matter! Proceeding with your shed requires smart planning. For starters, you may need a permit from your local zoning authority and/or homeowners’ association to build a new structure on your property; check with the proper authorities before you even invest in the materials. Plus, there may be rules that dictate how you may use your shed, or whether you’re allowed to wire it for electricity. Once you get the go-ahead to build, you’ll want reliable guidelines. For anyone inclined to DIY rather than buy a prebuilt shed, look over a selection of free LP Outdoor Building Solutions plans based on your choice of size and roof style. Each set of plans comes with extensive material and hardware lists, detailed construction information, and tried-and-true building tips. High-quality materials may cost a bit more, but they’ll save you time, trouble, and money in the long run. The chart here shows how LP® SmartSide® Panels compare with untreated plywood, vinyl, and galvanized metal. No wonder so many pros recommend sheds made with beautiful, durable LP products! If you want your shed to resist splitting, cracking, decay, and termite damage while duplicating the good looks of rich, real cedar, choose LP SmartSide® products. 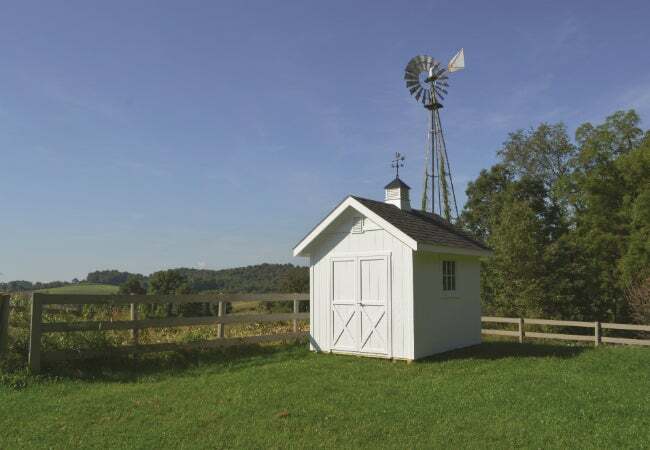 It’s vital to build your shed on a stable, level location—and never in a wet, low-lying area or on a downward slope. And no matter how well a shed is constructed, it won’t hold up on a weak base. A proper foundation is key, one that sets the shed slightly off the ground to aid water drainage and reduce moisture transfer. There are different foundation options, depending on where you live and the size and intended use of the shed, so bone up on the fundamentals and assess your options with this advice from the LP Outdoor Building Solutions team. A few decorative touches can help your shed fit in with the architecture of your home and even convey how you use it. Some folks like to dress things up with a front porch, dormer, or gable, but simply adding barn-style doors, shuttered windows, and a bit of gingerbread trim can make all the difference. Color, of course, goes a long way too. Check out all the options at the LP Shed Gallery, where you’ll also see details on the materials used. Inspired by the seemingly endless possibilities, you’ll emerge motivated to create a shed you’ll be proud to show off! Now that you’re aware of the best and worst practices, you’re probably eager to get started planning and building the perfect shed to enhance your property and your day-to-day life. Visit LPShed.com for the information and guidance you need to put your project in motion!